Let the sunshine in! | Finding delight. I’ve always associated thunderstorms with Autumn. Even though the sunlight casts a beautiful, warm hue in September and the temperature gives a reprieve, there’s always that looming possibility of a dark cloud rolling in. Never has this been more true than in South Florida. Out of no where the sky turns black as night and the cracks of thunder shake the furniture. Suddenly my sunny, cheerful, and PRODUCTIVE day comes to screeching halt. I’m all like, “Oh don’t mind me just gonna put my comfies back on at 2 in the afternoon. I’ll be in my bed watching YouTube videos on my laptop for the next 8 hours if anyone needs me! K, thanks!” Gloomy weather, dark skies, no chance of popping outside for a breath of fresh air to clear your head…it can be daunting. The only way through it – is to combat it! You’ve gotta radiate from within! 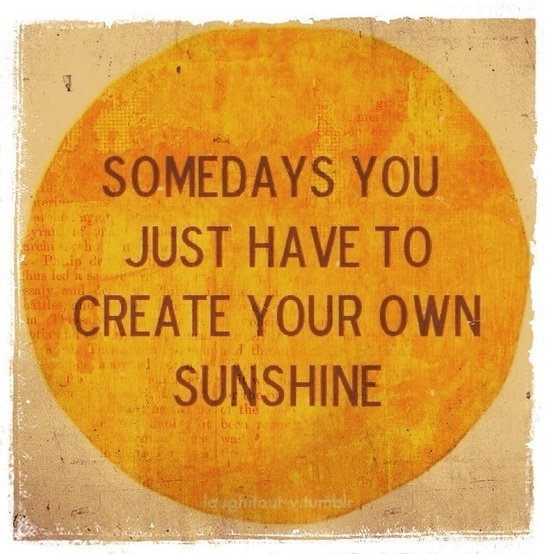 This is when the idea of creating your OWN sunshine really rings true. I’ve developed some tricks for creating my own sunshine. Of course, I love rolling out my mat and busting out a few yoga poses. I find heart-openers to be especially helpful on gloomy days. It’s almost like you can feel sunbeams shooting right out of your chest! I also enjoy going upside down. Something about all that blood flow to my brain gets me back in a creative and productive mood. Grabbing a little snack is another go-to. Lately, Chet and I have been having a goldfish cracker moment which always takes me back to Vacation Bible School days. And I can’t get enough of those cotton candy grapes. Grabbing a handful of either of these snacks puts an instant smile on my face. I also welcome other’s cheery dispositions to brighten my day by calling a friend or family member. There’s always the promise of an inside joke on the other end of the line. Finally, I LOVE LOVE LOVE lighting candles. My current favorites include Pomelo Paradise triple-wick from Bath & Body Works and the gorgeous new marble line from Target. Sunshine success!!! But these tactics may not work forever, dear reader, so I’d love to know…How do YOU create sunshine? How do you turn the tables on Mother Nature?